Happy National Hot Fudge Sundae Day! How's about a Hot Fudge Sundae Martini? Who doesn't like a hot fudge sundae? Especially one with vodka in it? Yes, I turned this favorite ice cream dessert into a cocktail. You won't need a spoon for this sundae. DIRECTIONS Add the chopped peanuts to a small plate. Add 1 tablespoon of the melted hot fudge to another small plate. Dip your glass rim in the melted hot fudge and then into the peanuts. Drizzle some of the hot fudge into the glass bowl. Chill the glass in the freezer. Add the rest of the hot fudge to a blender with the vodkas and the ice cream and blend until smooth. Pour into your chilled glass, garnish and serve. Make extra - trust me! National Hot Fudge Sundae Day is July 25th. 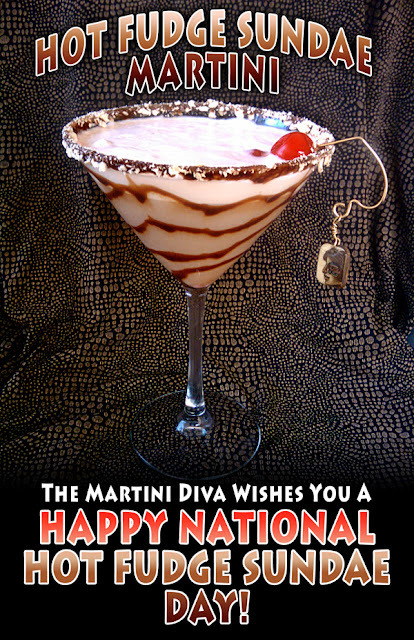 Get the Hot Fudge Sundae Martini Recipe on a Recipe Post Card.